Description: Available in frequency range of 433/868/915MHz ISM bands, these RFM23BP RF Transceiver choices come with sensitivity of –120 dBm, output power range of +30 dBm Max (RFM23BP) and low power consumption of 25 mA receive & 550 mA @ +30 dBm transmit. Some of its working specifications include data rate of 0.123 to 256 kbps, ultra low power shutdown mode, digital RSSI, auto-frequency calibration (AFC) support, antenna diversity and TR switch control, preamble detector, low battery detector, integrated voltage regulators and frequency hopping capabilities. Some of its applications include in remote control, home security & alarm, telemetry, personal data logging, tire pressure monitoring, wireless PC peripherals, remote keyless entry, sensor networks among others. Bee ZB / ZigBee modules provide cost-effective wireless connectivity to devices in ZigBee mesh networks. Utilizing the ZigBee PRO Feature Set, these modules are interoperable with other ZigBee devices, including devices from other vendors. The most common factor in determining whether to use ZB is the potential need to tie-in with other ZigBee-compatible networks or mesh networking. If this is not a requirement, the series 1 802.15.4 modules may be perfectly suitable for your project. 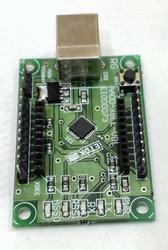 Note: Because XBee modules have 2 mm pin spacing, we recommend one of our adapter boards for each module. Our adapter boards provide several advantages to the XBee modules such breadboard-friendly standard 0.1 inch pin spacing, mounting holes, and easy-to-solder connections. 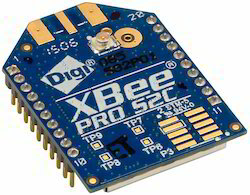 Even if you are communicating point-to-point without a PC, we still recommend that you always have at least one XBee USB Adapter Board (# 32400) so you can easily configure and test each XBee module prior to putting it in a point-to-point application. XBee ZB / ZigBee modules provide cost-effective wireless connectivity to devices in ZigBee mesh networks. Utilizing the ZigBee PRO Feature Set, these modules are interoperable with other ZigBee devices, including devices from other vendors. The ZB modules requires considerable setup and configuration. 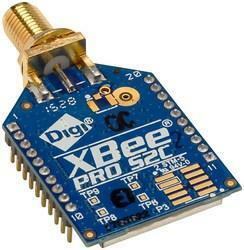 XBee Series 1 (802.15.4) and XBee Series 2 (ZB / ZigBee) modules have the same pin-out. However, Series 1 modules cannot communicate with Series 2 modules. Digi International move both the Series 1 and Series 2 functionality to the S2C hardware. 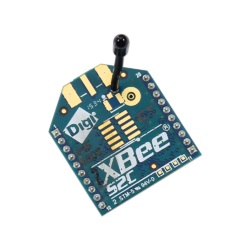 This XBee S2C model is as replacement/upgrade for the XBP24BZ7WIT-004. 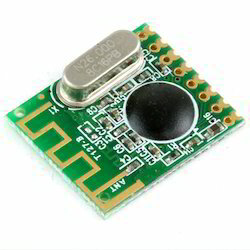 Interfacing Board used to interface ZigBee wireless Module with Desktop or Laptop computer systems.With the aid of our XBEE Explorer USB customers can easily communicate between PC to PC or PC to embedded boards. These Explorer are highly suitable for changing the modules of varied devices using PC through USB port. 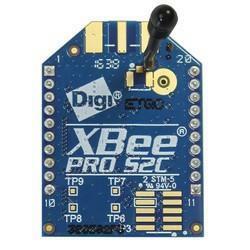 This Explorer works with all XBee modules including the Series 1 and Series 2.5, standard and Pro version. We have equipped the adapters with five indicator LED's for depicting the status of the data being received or transmitted, power, signal strength of the recipient and other associated data. 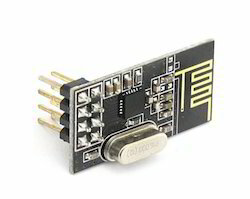 As ZigBee communicates through Serial Communication so other end of USB which is connected to PC, treated as COM port for Serial Communication. It is provided with indication LEDs for ease. Description: Coming in frequency range of 433/868/915MHz ISM bands, these RFM22B FSK Transreceiver choices come with sensitivity of –121 dBm and output power range of +20 dBm Max. With low power consumption, some of its working features include low power shutdown mode, digital RSSI, wake-up timer, auto-frequency calibration (AFC), power-on-reset (POR) among others. Further, this RFM22B Transceiver delivers data rate of 0.123 to 256 kbps, antenna diversity and TR switch control, configurable packet handler, TX and RX 64 byte FIFOs, on-chip crystal tuning, 14-PIN DIP 16-PIN SMD package and low cost operations. Air data rate up to 2Mbps. Description: RFM75 is a low-power, high-speed FSK/GFSK transceiver module specifically operating in the world wide ISM frequency band at 2400 - 2483.5 MHz. 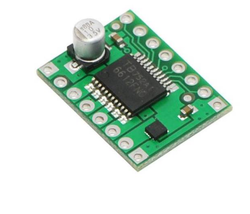 RFM75 module features low cost, small size, high stability and good consistency. The maximum air data rate can be up to 2Mbps. It can be widely applied in various wireless connections in daily life or activities. It is compliant with the specifications regulated and required by FCC and ETSI. Description: Supporting multiple baud rates of 4800/9600/19200/38400, these Wireless RF CC2500 Transceiver work on ISM band (2. 4 ghz) reserved internationally that do not require any license. These Wireless RF CC2500 Transceiver also support multiple frequencies within same band rate that helps in avoiding data collision with no requirement of complex wireless connection software for connecting to serial devices. Further, these wireless RF CC2500 Transreceiver do not require external antenna and work on 5-9v DC supply with standard uart interface. Suitable for transmitting and receiving data at multiple baud rates, the module is direct line in replacement for serial communication and finds applications for wireless sensor network, wireless device control, wireless data transfer, wireless energy metering, robotics, wireless data logger and others. 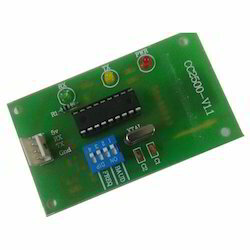 Description: Wireless RF Module CC2500 2.4GHz options is suitable for delivering clear channel assessment, data buffering, wake on radio, burst transmissions, link quality indication. Further, it comes with option of Manchester coding of data stream by modulator and decoded by demodulator. Some of its end usage areas include Consumer Electronics, Wireless audio & game controllers as well as in other wireless systems. Some of its working specifications include low current consumption, efficient SPI interface, operating temperature range from -40 to 85, available frequency of 2.4 to 2.483 GHz, Hi sensitivity of -101dBm @10kbps among others. CC2500 2.4GHz have powerful digital features also support building high-performance RF system support. Digital transmission chip NRF24L01 + with the Division of Professional Design professional full two-way RF power amplifier high power PA and LNA chip, RF switches, bandpass filters, etc., makes effective communication distance greatly expand. High stability of the work. 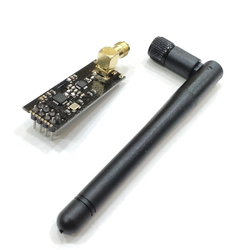 NRF24L01P + PA + LNA wireless module integration is extremely high, the size of only 41mm * 15.5mm, convenient embed. 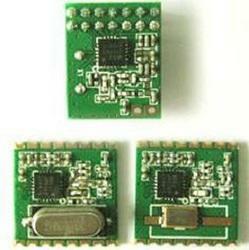 Looking for 2.4GHz RF Wireless Transreveiver Module ?